There are two, low barrier to entry ways to get some quick metrics about your application’s test code and the coverage it provides. There are others, but today we’re going to focus on the two that are easiest to run and on what they mean: rake stats and rcov. The first tool available to us comes built into Rails, and that’s rake stats. If you haven’t used it before, rake stats, when run, outputs a quick summary of the lines of code, lines of test code, number of classes, number of methods, the ratio of methods to classes, and the ratio of lines of code per method. Lets take a look at the output from the application Joe, Mike, Micah, and myself built for the Rails Rumble, Where’s the Milk At?. A Code to Test Ratio of 1 to 3.8 is somewhat ridiculous. Its incredibly high, and when you see something like this, its important to ask why? That’s pretty much the entire usefulness of the output of rake stats as a metric. Here are some guidelines I’ve devised, based on the experience of looking at a bunch of applications I consider well tested and poorly tested. Anything more than 1:2 is suspect to questioning, but upon investigation could be found to be perfectly reasonable. There are a few other nice things in the output from rake stats that are helpful for a birds eye view of the application. For example, you can tell that we didn’t write integration tests, and our application has 5 models and 10 controllers. We were on a 48 hour clock. Upon inspection of the Where’s the Milk At test code, I actually found very few, if any, instances of any of the above. In fact, I found that we used extensive use of the macros Shoulda provides, we wrote our application specific macros, such as should_have_map and should_display, and we used good practice of shared contexts. So, I put this aside as a possible cause, but now that I’ve started to review the test code, I’ve started to develop some new ideas about our code to test ratio that I’ll come back to later on. We used several helpful shoulda test macros to speed up development. My initial suspicion was that these macros were being counted as lines of test code. After investigating, I was able to determine that rake stats only looks in test/unit, test/functional, and test/integration, so this isn’t the case. I putthis aside for now, and pocket the info about how rake stats works internally for possible future use some time down the road. The last of my initial assumptions about our ratio (the astute reader will notice I’m 0 for 2 now) is that we have several complex named scopes that are only 1 to 3 lines of code, but have many more lines of test code. Upon inspection, this is the case. Lets take a look at an example. And here is the accompanying test (this test was pure TDD, the tests were written a little bit at a time before the named scope was actually written). You can see that for our 3 line namedscope, we have 23 lines of test code. That’s a ratio of 1:8, and this is an example of one of the simpler named scopes in the the application (assertall is an assertion we wrote). Additionally, we could make this ratio slightly worse (or better, depending on how you’re looking at it) by putting the named scope all on one line, instead of 3. There are quite a few of these finders and accompanying tests, and I feel confident after investigating that this is one of the reasons for the ratio. In reviewing the test code, I started to notice a few other things the contribute to the ratio. When you use stubbing for tests, its best practice to write the stubs and then write expectations for what you’ve stubbed. We’re doing this in the above code by putting the stubs in the setup (3 lines of test code) and then using shoulda’s before_should to declare the expectations (9 lines of test code). That’s 12 lines of test code for what is ultimately 1 line of code. Now, there isn’t anything necessarily wrong with this, again, we’re only investigating causes of the ratio here. But its something to note and perhaps consider for either test refactoring or to somehow incorporate in your test framework. I’ve spent a lot of time talking about rake stats, but here’s the rub. It’s worthless to tell you the real important metric, how good your test code is. Or, said differently, how much coverage your tests provide for your actual code. You really only want to use rake stats for a high level assessment of your code and as one tool in the arsenal you’ll use for investigation in how to improve your tests. The guidelines I outlined above are the extent of how you should use rake stats for judging your test code. And as I’ve illustrated here, your assumptions about your test code, and even my guidelines may be wrong or flexible. In fact, based on what I’ve uncovered about the view LOC and the stub/expectations, I may begin to reevaluate my 1:2 guideline. rcov executes your tests and does the best job it can telling which lines of code were executed by your tests. The theory being, that if the line of code is executed, then there was a test for it. Rcov provides C0 coverage, so it cannot tell if two parts of a conditional were both hit, the line being executed means that that line had coverage. You should get the latest rcov from github, it crashes less. In order to easily run rcov on your rails app, you can use this rake task, which is included in our plugin that provides standard tasks, limerick_rake, which is in turn included in our Rails application template, Suspenders. This shows us that, according to rcov, 100% of the lines of code in our application were executed when our tests were run. This is great, but as with most things, isn’t the whole story and should be taken with a grain of salt. Here are some guidelines/principals you should take into consideration for rcov. Since rcov only provides C0 coverage reports, 100% doesn’t mean that you don’t have bugs or that you’re even perfectly tested. If you’re doing real, actual, TATFT TDD, then reaching 100% coverage (as reported by rcov) should be a reachable goal; in fact, if you have less than 80% and you think you’ve been doing TDD, something is not right and you should investigate. The most important lesson we can take away from rcov is that its not perfect, but it provides a good benchmark. When its not reporting 100%, you can click through and see exactly which lines of code were not executed by your tests. So, in short, its great at identifying deficiencies in your test suite, but should not be taken as a false safety net, thinking that with 90-100% coverage you’re all good because there can be big holes in your coverage and you’d still be reporting 100%. Hopefully you’ve gotten a good idea of what to look for and how to use these two simple tools to investigate the quality of your tests. 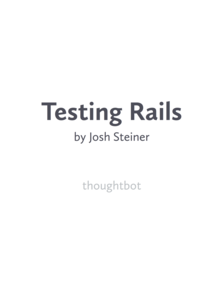 The benchmarks and guidelines I’ve presented here are based on my experience developing over 30 rails applications and reviewing the different stats and coverage reports I’ve seen from them, but that doesn’t mean they are inflexible or infallible. Also, these metrics, the tools, and other ones that exist out there are meant to assist, but not replace your role as a developer. To correctly understand the problem domain and have confidence in the code itself and the test suite, and to realize the obvious fact that these tools do not analyze the logical correctness of anything you’ve done. Here are the guidelines again, in summary. Anything less than 1:1 code to test ratio from rake stats probably lacks sufficient tests.